If you're a fan of rugby union then the 2019 Rugby World Cup in Japan should be an exciting prospect. 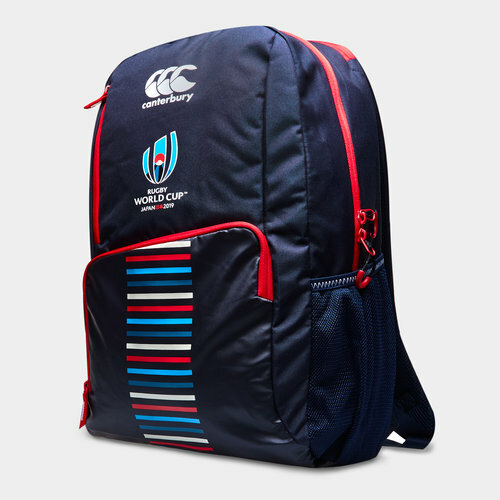 Commemorate the tournament whilst helping carry your kit to training with this RWC 2019 Rugby Backpack from Canterbury. Monumentalize what's tipped to be one of the closest world cups yet with this backpack. This bag will help keep your kit organised as whilst being water resistant it has a number of compartments. Ensuring all of your items are stored and accessed easily this bag has compartments boasting varied functionalities. With one main compartment and two front smaller pockets this bag comes with a 4th compartment at the rear which is designed to allow secure storage of laptops or tablets. To ensure complete comfort whilst wearing and carrying this bag has a re-engineered back panel providing triple layer comfort whilst allowing air to flow down the the centre of the back. Commemorating the tournament this bag comes in the colour scheme of this years competition in Japan with the logo on the font of the bag along with it's designer, Canterbury.